Oh hey there... Remember me? It has been way too long this time. With my two major assignments handed in, I thought I would be able to get a grip with my blogging and get back into it. The truth is because I have been cooped up in my room, in the library or spending 2h studying in Costa for the majority of the time that I have been back in England, I honestly did not have anything great to show you. I did not really want to put up random photos of my food or whatsoever so I thought I would just wait it out. And so wait it out I did and here we are with something I genuinely forgot to show you! 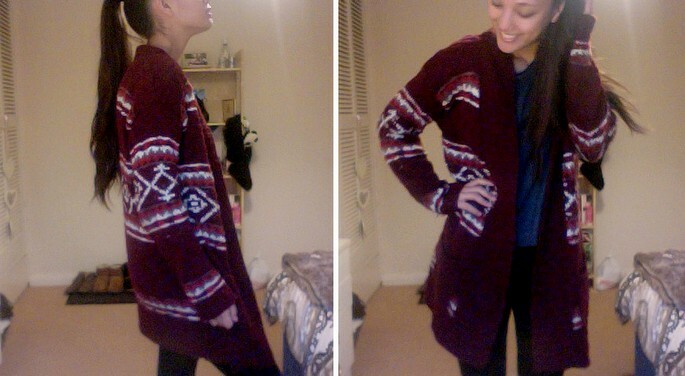 I bought this oversized thick aztec bordeaux could-you-possibly-fit-anymore-trends-into-it cardigan in Primark back in December before I headed home. It is so cosy and I have been living in it ever since (trust me I have washed it haha). A lot of my cardigans fall to my hips so it is nice to finally have one that covers my bum too!